The Fertile Crescent is a crescent-shaped region in the Middle East, spanning modern-day Iraq, Israel, Palestinian Territories, Syria, Lebanon, Egypt, and Jordan as well as the southeastern fringe of Turkey and the western fringes of Iran. Some authors also include Cyprus. This fertile crescent is approximately a semicircle, with the open side toward the south, having the west end at the southeast corner of the Mediterranean, the center directly north of Arabia, and the east end at the north end of the Persian Gulf (see map, p. 100). It lies like an army facing south, with one wing stretching along the eastern shore of the Mediterranean and the other reaching out to the Persian Gulf, while the center has its back against the northern mountains. The end of the western wing is Palestine; Assyria makes up a large part of the center; while the end of the eastern wing is Babylonia. 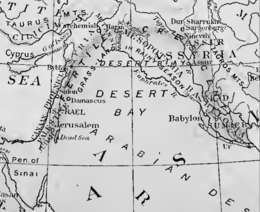 This great semicircle, for lack of a name, may be called the Fertile Crescent.1 It may also be likened to the shores of a desert-bay, upon which the mountains behind look down—a bay not of water but of sandy waste, some eight hundred kilometres across, forming a northern extension of the Arabian desert and sweeping as far north as the latitude of the northeast corner of the Mediterranean. This desert-bay is a limestone plateau of some height—too high indeed to be watered by the Tigris and Euphrates, which have cut cañons obliquely across it. Nevertheless, after the meager winter rains, wide tracts of the northern desert-bay are clothed with scanty grass, and spring thus turns the region for a short time into grasslands. The history of Western Asia may be described as an age-long struggle between the mountain peoples of the north and the desert wanderers of these grasslands—a struggle which is still going on—for the possession of the Fertile Crescent, the shores of the desert-bay. 1 There is no name, either geographical or political, which includes all of this great semicircle (see map, p. 100). Hence we are obliged to coin a term and call it the Fertile Crescent. In current usage, the Fertile Crescent includes Israel, Palestine, Iraq, Syria, Lebanon, Egypt, and Jordan, as well as the surrounding portions of Turkey and Iran. Water sources include the Jordan River. The inner boundary is delimited by the dry climate of the Syrian Desert to the south. Around the outer boundary are the Anatolian highlands to the north, the Sahara Desert to the west and the Iranian Plateau to the east. 1916 map of the Fertile Crescent by James Henry Breasted, who popularised usage of the word. As crucial as rivers and marshlands were to the rise of civilization in the Fertile Crescent, they were not the only factor. The area is geographically important as the "bridge" between Africa and Eurasia, which has allowed it to retain a greater amount of biodiversity than either Europe or North Africa, where climate changes during the Ice Age led to repeated extinction events when ecosystems became squeezed against the waters of the Mediterranean Sea. The Saharan pump theory posits that this Middle Eastern land bridge was extremely important to the modern distribution of Old World flora and fauna, including the spread of humanity. The area has borne the brunt of the tectonic divergence between the African and Arabian plates and the converging Arabian and Eurasian plates, which has made the region a very diverse zone of high snow-covered mountains. The Fertile Crescent had many diverse climates, and major climatic changes encouraged the evolution of many "r" type annual plants, which produce more edible seeds than "K" type perennial plants. The region's dramatic variety in elevation gave rise to many species of edible plants for early experiments in cultivation. Most importantly, the Fertile Crescent was home to the eight Neolithic founder crops important in early agriculture (i.e., wild progenitors to emmer wheat, einkorn, barley, flax, chick pea, pea, lentil, bitter vetch), and four of the five most important species of domesticated animals—cows, goats, sheep, and pigs; the fifth species, the horse, lived nearby. The Fertile Crescent flora comprises a high percentage of plants that can self-pollinate, but may also be cross-pollinated. These plants, called "selfers", were one of the geographical advantages of the area because they did not depend on other plants for reproduction. Area of the fertile crescent, circa 7500 BC, with main sites of the Pre-Pottery Neolithic period. The area of Mesopotamia proper was not yet settled by humans. As well as possessing many sites with the skeletal and cultural remains of both pre-modern and early modern humans (e.g., at Tabun and Es Skhul caves in Israel), later Pleistocene hunter-gatherers, and Epipalaeolithic semi-sedentary hunter-gatherers (the Natufians); the Fertile Crescent is most famous for its sites related to the origins of agriculture. The western zone around the Jordan and upper Euphrates rivers gave rise to the first known Neolithic farming settlements (referred to as Pre-Pottery Neolithic A (PPNA)), which date to around 9,000 BCE and includes very ancient sites such as Göbekli Tepe and Jericho. This region, alongside Mesopotamia (which lies to the east of the Fertile Crescent, between the rivers Tigris and Euphrates), also saw the emergence of early complex societies during the succeeding Bronze Age. There is also early evidence from the region for writing and the formation of hierarchical state level societies. This has earned the region the nickname "The cradle of civilization". It is in this region where the first libraries appeared, about 4,500 years ago. The oldest known libraries are found in Nippur (in Sumer) and Ebla (in Syria), both from c. 2500 BC. Both the Tigris and Euphrates start in the Taurus Mountains of what is modern-day Turkey. Farmers in southern Mesopotamia had to protect their fields from flooding each year, except northern Mesopotamia which had just enough rain to make some farming possible. To protect against flooding, they made levees. Since the Bronze Age, the region's natural fertility has been greatly extended by irrigation works, upon which much of its agricultural production continues to depend. The last two millennia have seen repeated cycles of decline and recovery as past works have fallen into disrepair through the replacement of states, to be replaced under their successors. Another ongoing problem has been salination — gradual concentration of salt and other minerals in soils with a long history of irrigation. Prehistoric seedless figs were discovered at Gilgal I in the Jordan Valley, suggesting that fig trees were being planted some 11,400 years ago. Cereals were already grown in Syria as long as 9,000 years ago. Small cats (Felis silvestris) also were domesticated in this region. Linguistically, the Fertile Crescent was a region of great diversity. Historically, Semitic languages generally prevailed in the lowlands, whilst in the mountainous areas to the east and north a number of generally unrelated languages were found including Elamite, Kassite, and Hurro-Urartian. The precise affiliation of these, and their date of arrival, remain topics of scholarly discussion. However, given lack of textual evidence for the earliest era of prehistory, this debate is unlikely to be resolved in the near future. Northeast Caucasian languages. Possibly including Hurro-Urartian languages, a small branch possibly also related to the Kassite language spoken in the Northern part of the region. Proto-Euphratean language – a non-Semitic language considered to be the substratum language of the people that introduced farming into Southern Iraq in the Early Ubaid period (5300-4700 BC). Semitic languages – Akkadian, Amorite, Aramaic, Ugaritic, Canaanite. Hattic – a language isolate, spoken originally in central Anatolia. Indo-European languages – generally believed to be later intrusive languages, such as Hittite and the Indo-Aryan material attested in the Mittani civilization. Links between Hurro-Urartian and Hattic and the indigenous languages of the Caucasus have frequently been suggested, but are not generally accepted. ^ Haviland, William A.; Prins, Harald E. L.; Walrath, Dana; McBride, Bunny (13 January 2013). The Essence of Anthropology (3rd ed.). Belmont, California: Cengage Learning. p. 104. ISBN 978-1111833442. ^ Ancient Mesopotamia/India. Culver City, California: Social Studies School Service. 2003. p. 4. ISBN 978-1560041665. ^ The Editors of Encyclopaedia Britannica. "Fertile Crescent". Encyclopædia Britannica. Cambridge University Press. Retrieved 28 January 2018. ^ a b Abt, Jeffrey (2011). American Egyptologist: the life of James Henry Breasted and the creation of his Oriental Institute. Chicago: University of Chicago Press. pp. 193–194, 436. ISBN 978-0-226-0011-04. ^ Goodspeed, George Stephen (1904). A History of the ancient world: for high schools and academies. New York: Charles Scribner's Sons. pp. 5–6. ^ Breasted, James Henry (1914). "Earliest man, the Orient, Greece, and Rome" (PDF). In Robinson, James Harvey; Breasted, James Henry; Beard, Charles A. (eds.). Outlines of European history, Vol. 1. Boston: Ginn. pp. 56–57. "The Ancient Orient" map is inserted between pages 56 and 57. ^ Breasted, James Henry (1916). Ancient times, a history of the early world: an introduction to the study of ancient history and the career of early man (PDF). Boston: Ginn. pp. 100–101. "The Ancient Oriental World" map is inserted between pages 100 and 101. ^ Clay, Albert T. (1924). "The so-called Fertile Crescent and desert bay". Journal of the American Oriental Society. 44: 186–201. doi:10.2307/593554. JSTOR 593554. ^ Kuklick, Bruce (1996). "Essay on methods and sources". Puritans in Babylon: the ancient Near East and American intellectual life, 1880–1930. Princeton: Princeton University Press. p. 241. ISBN 978-0-691-02582-7. Textbooks...The true texts brought all of these strands together, the most important being James Henry Breasted, Ancient Times: A History of the Early World (Boston, 1916), but a predecessor, George Stephen Goodspeed, A History of the Ancient World (New York, 1904), is outstanding. Goodspeed, who taught at Chicago with Breasted, antedated him in the conception of a 'crescent' of civilization. ^ a b c Diamond, Jared (March 1997). Guns, Germs, and Steel: The Fates of Human Societies (1st ed.). W.W. Norton & Company. p. 480. ISBN 978-0-393-03891-0. OCLC 35792200. ^ Murray, Stuart (9 July 2009). Basbanes, Nicholas A.; Davis, Donald G. (eds.). The Library: An Illustrated History. Internet Reference Services Quarterly. 15. New York, NY: Skyhorse Publishing, Inc. pp. 69–70. doi:10.1080/10875300903535149. ISBN 9781628733228. OCLC 277203534. ^ Beck, Roger B.; Black, Linda; Krieger, Larry S.; Naylor, hillip C.; Shabaka, Dahia Ibo (1999). World History: Patterns of Interaction. Evanston, IL: McDougal Littell. p. 1082. ISBN 978-0-395-87274-1. ^ Norris, Scott (1 June 2006). "Ancient Fig Find May Push Back Birth of Agriculture". National Geographic Society. National Geographic News. Retrieved 6 March 2017. ^ "Genographic Project: The Development of Agriculture". National Geographic. Retrieved 14 April 2016. ^ Driscoll, Carlos A.; Menotti-Raymond, Marilyn; Roca, Alfred L.; Hupe, Karsten; Johnson, Warren E.; Geffen, Eli; Harley, Eric H.; Delibes, Miguel; Pontier, Dominique; Kitchener, Andrew C.; Yamaguchi, Nobuyuki; O'Brien, Stephen J.; Macdonald, David W. (27 July 2007). "The near eastern origin of cat domestication". Science. 317 (5837): 519–23. doi:10.1126/science.1139518. PMC 5612713. PMID 17600185. ^ Steadman & McMahon 2011, p. 233. ^ Steadman & McMahon 2011, p. 522. ^ Steadman & McMahon 2011, p. 556. ^ Potts 2012, p. 28. ^ Potts 2012, p. 570. ^ Potts 2012, p. 584. ^ Bernice Wuethrich (19 May 2000). "Peering Into the Past, With Words". Science. 288 (5469): 1158. doi:10.1126/science.288.5469.1158. Anderson, Clifford Norman. The Fertile Crescent: Travels In the Footsteps of Ancient Science. 2d ed., rev. Fort Lauderdale: Sylvester Press, 1972. Deckers, Katleen. Holocene Landscapes Through Time In the Fertile Crescent. Turnhout: Brepols, 2011. Ephʻal, Israel. The Ancient Arabs: Nomads On the Borders of the Fertile Crescent 9th-5th Centuries B.C. Jerusalem: Magnes Press, 1982. Kajzer, Małgorzata, Łukasz Miszk, and Maciej Wacławik. The Land of Fertility I: South-East Mediterranean Since the Bronze Age to the Muslim Conquest. Newcastle upon Tyne, UK: Cambridge Scholars Publishing, 2016. Kozłowski, Stefan Karol. The Eastern Wing of the Fertile Crescent: Late Prehistory of Greater Mesopotamian Lithic Industries. Oxford: Archaeopress, 1999. Potts, Daniel T. (21 May 2012). A Companion to the Archaeology of the Ancient Near East. 1. John Wiley & Sons. p. 1445. doi:10.1002/9781444360790. ISBN 9781405189880. Steadman, Sharon R.; McMahon, Gregory (15 September 2011). The Oxford Handbook of Ancient Anatolia: (10,000-323 BCE). OUP. p. 1174. ISBN 9780195376142. Thomas, Alexander R. The Evolution of the Ancient City: Urban Theory and the Archaeology of the Fertile Crescent. Lanham: Lexington Books/Rowman & Littlefield Publishers, 2010. 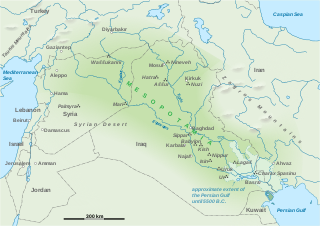 Wikimedia Commons has media related to Fertile Crescent. The Hurrians were a people of the Bronze Age Near East. They spoke a Hurro-Urartian language called Hurrian and lived in Anatolia and Northern Mesopotamia. The largest and most influential Hurrian nation was the kingdom of Mitanni, the Mitanni perhaps being Indo-Iranian speakers who formed a ruling class over the Hurrians. The population of the Indo-European-speaking Hittite Empire in Anatolia included a large population of Hurrians, and there is significant Hurrian influence in Hittite mythology. By the Early Iron Age, the Hurrians had been assimilated with other peoples. Their remnants were subdued by a related people that formed the state of Urartu. According to a hypothesis by I.M. Diakonoff and S. Starostin, the Hurrian and Urartian languages shared a common ancestor and were related to the Northeast Caucasian languages, however, this theory is controversial and not universally accepted. The present-day Armenians are an amalgam of the Indo-European groups with the Hurrians and Urartians. The Kassites were people of the ancient Near East, who controlled Babylonia after the fall of the Old Babylonian Empire c. 1531 BC and until c. 1155 BC. The endonym of the Kassites was probably Galzu, although they have also been referred to by the names Kaššu, Kassi, Kasi or Kashi. James Henry Breasted was an American archaeologist, Egyptologist, and historian. After completing his PhD at the University of Berlin in 1894, he joined the faculty of the University of Chicago. In 1901 he became director of the Haskell Oriental Museum at the university, where he continued to concentrate on Egypt. In 1905 Breasted was promoted to full professor, and held the first chair in Egyptology and Oriental History in the United States. In 1919 he became the founder of the Oriental Institute at the University of Chicago, a center for interdisciplinary study of ancient civilizations. Breasted was a committed field researcher, and had a productive interest in recording and interpreting ancient writings, especially from sources and structures that he feared may be lost forever. The Kura–Araxes culture or the early trans-Caucasian culture was a civilization that existed from about 4000 BC until about 2000 BC, which has traditionally been regarded as the date of its end; in some locations it may have disappeared as early as 2600 or 2700 BC. The earliest evidence for this culture is found on the Ararat plain; it spread northward in Caucasus by 3000 BC. The Syrian Desert, also known as the Syrian steppe, the Jordanian steppe, or the Badia, is a region of desert, semi-desert and steppe covering 500,000 square kilometers of the Middle East, including parts of south-eastern Syria, northeastern Jordan, northern Saudi Arabia, and western Iraq. It accounts for 85% of the land area of Jordan and 55% of Syria. To the south it borders and merges into the Arabian Desert. The land is open, rocky or gravelly desert pavement, cut with occasional wadis. Urartu, which corresponds to the biblical mountains of Ararat, is the name of a geographical region commonly used as the exonym for the Iron Age kingdom also known by the modern rendition of its endonym, the Kingdom of Van, centered around Lake Van in the historic Armenian Highlands.